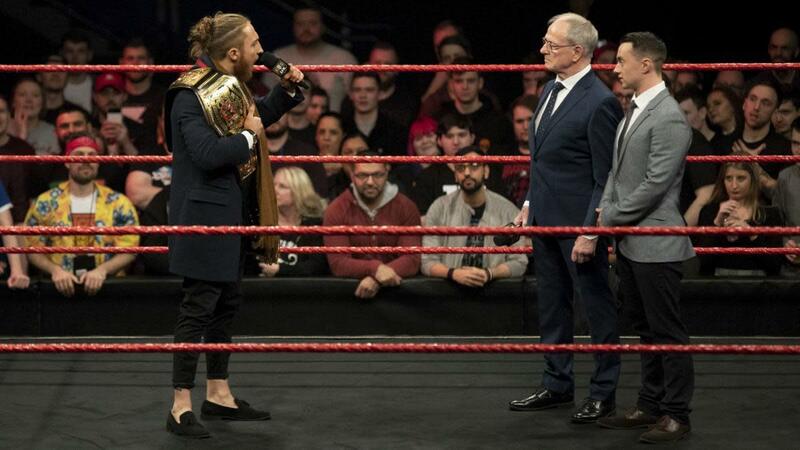 Johnny Saint and Sid Scala announced that Pete Dunne would defend his WWE United Kingdom title at TakeOver: New York, prompting Dunne to come out and demand the match be against WALTER. After a few weeks of building up the match, Eddie Dennis beat Ligero. The Wild Boar & Primate appeared as a new team called The Hunt and quickly destroyed Lewis Howley & Sam Stoker. Kassius Ohno, technically in his NXT UK debut (at least in the actual UK -- he was on the show against WALTER in a match taped at Royal Rumble Axxess a few weeks ago), beat Ashton Smith and attacked him post-match, prompting Travis Banks to come out. In an excellent main event, Tyler Bate defeated James Drake, cementing British Strong Styles' claim to an NXT UK Tag Team title rematch. - The show was opened by NXT UK general manager Johnny Saint and his assistant Sid Scala with an important announcement. They announced that Pete Dunne would be defending his WWE UK title at NXT TakeOver: New York over WrestleMania weekend. Scala said the question is now who Dunne will defend the title against. But before he could come to that, Dunne came to the ring, grabbed the mic, and just said: "Give me WALTER!" before leaving again. - Toni Storm was being interviewed backstage about what Jinny had said about her last week. Storm laughed and said that while they were very different, they both really love gold. Storm said she has the NXT UK Women's Championship -- while Jinny only has the kind of gold you can buy in a store. Storm said that when Jinny is in the ring with her, Jinny actually has to work hard. As Storm went down the stairs, she passed Rhea Ripley and they gave each other the stink-eye. Ripley said she heard what Xia Brookside said about her last week and called her out. They started off strong with Ligero showing some speed on offense, but he got caught when launching himself over the top onto Dennis on the outside. Dennis unceremoniously slammed him on the apron. From that point, Dennis took over and just beat up Ligero mercilessly, almost knocking him out with a stiff forearm. Ligero managed to get back on his feet and hold onto the ropes, hitting an innovative facebuster onto his thigh from a lucha style counter. This time around, Ligero hit his mark on launching himself over the top rope and hit a nice hurricanrana on Dennis on the outside in the process. Ligero hit a splash from climbing up onto the ropes in the middle of the ring for a near fall, but he missed a somersault plancha off the top, prompting Dennis to strike him down again. Ligero countered the Next Stop Driver and hit an enzuigiri. Ligero got caught off his springboard DDT off the ropes, but he managed to turn it into a Code Red for another near fall. Dennis stopped another aerial attack attempt short and hit an impressive deadlift vertical superplex off the middle rope. He followed up with the Severn Bridge and finally hit the Next Stop Driver for the victory. - Amir Jordan talked to Kenny Williams backstage and they argued about whether they deserved a shot at the Tag Team titles and who would talk to Saint about it. Williams instead prompted him to put in the work in the gym to do a sort of pull-up/push-up on a rack. It ended with Jordan wanting Williams to dance with him, prompting Williams to walk off. So, no idea if they'll get their title shot or not. Howley and Stoker came out wearing dress shirts, while The Hunt came out wearing boar and gorilla masks respectively and looked like a real killer team right from the get go. Primate started out with Stoker and hit an overhead suplex before tagging out. Boar threw him around a bit before tagging back out as The Hunt hit a double slam and Primate threw Boar onto Stoker. Primate had his way with Stoker and the Hunt tagged in and out in quick succession, hitting one innovative move after the other on their opponents. It ended with Boar hitting a pounce on Howley, then throwing him into Primate -- who transitioned the momentum into a high-angle back drop driver for the win. They bumped fists to start out before Ohno quickly started working the arm and applying wristlocks and hammerlocks on the ground in order to demonstrate his knowledge of the European style. Jordan tried to slam Ohno but couldn't get him up. He managed to throw Ohno out of the ring, but got caught with a thigh to the head on a dive attempt. Ohno suplexed him for a near fall, then locked in a submission. Jordan escaped but once more failed on an attempt of a Samoan drop. Jordan came back with some offense and finally hit the move, but only got a two count off it. Ohno hit a boot to the face and a back senton, then hit the ripcord elbow to the back of the head for the win. After the match, Ohno talked to Jordan and helped him to his feet. He did Jordan's raised arm pose and offered his fist for another fist bump, but then quickly hit another spinning elbow, knocking Jordan out again. Travis Banks came out and briefly had words with Ohno before looking out for Jordan. Ohno tried entering the ring again but got scared off by Banks and finally left. - Gallus were shown in a pub. Joe Coffey said they need to re-establish dominance again in order to stay on top. They started out quick -- but neither one could get an advantage. Drake worked over the arm, but Bate escaped and hit a standing dropkick. Bate got Drake up for the airplane spin, but Drake escaped after a few rounds and sent Bate to the outside. Drake rammed Bate into the barriers and took over once they were back inside. Bate eventually came back with a flurry of punches, a standing hurricanrana, and a high-angle back body drop. He hit a knee lift off a reversal, then followed with a flying European uppercut and an exploder suplex. Drake moved out of the way of a standing Shooting Star, but Bate landed on his feet and just hit another one that connected like it was nothing. Drake managed to pull Bate out of the ring, but he got sent into the dasher boards on a reversal. Drake then hit a front face slam from a tombstone position for a near fall to even the odds again. They traded roll-up attempts and jackknife covers until Bate connected with his springboard lariat off the ropes. Drake countered out of the Tyler Driver '97 and hit a running dropkick into the corner for another near fall. Drake missed a 450 off the top but landed on his feet, only to eat an exploder into the corner. Bate then hit the Spiral Tap off the top for the victory. - As Bate was celebrating, the cameras went backstage and Scala and Saint confirmed that WALTER would indeed challenge Dunne for the WWE UK title at NXT TakeOver: New York.